Saatva Solaire Mattress Review - Adjustable Comfort? Home » Saatva Solaire Mattress Review – Adjustable Comfort? Do you have trouble finding the exact firmness you are looking for? Do you often change positions while you sleep? If so, it might be worth considering the Saatva Solaire mattress. The Solaire is an air bed with adjustable firmness. Basically, a remote control allows you to inflate and deflate the air chambers to find the desired amount of comfort and support. I have been a fan of Saatva’s other mattresses, and I was excited to try out the Solaire. Will you find the perfect firmness on the Solaire? Read on for my full review. The Saatva Solaire is a very comfortable mattress with adjustable firmness. It is a great fit for light- and medium-weight people of any sleeping position. You want a mattress with adjustable firmness. The Solaire is a great choice if you want a mattress with a variety of firmnesses. You can choose from 50 firmness levels, so you should be able to find just the right firmness for you. You are a lightweight or medium-weight sleeper. As long as you aren’t too heavy, it should be easy to find the right firmness for any sleeping position. At firmer settings, the mattress should be a great fit for back and stomach sleepers. If you soften the mattress a bit, it should fit side sleepers as well. You want a mattress that works on an adjustable base. The Solaire pairs well with the Saatva Lineal adjustable base. This allows you to raise and lower the bed as well as use a massage function. With the Upper-Flex additional feature, you can also raise and lower each side separately. You want an adjustable mattress for couples. If you sleep with a partner, the Solaire should be a great option for you. With the Solaire, each side is adjustable. This means you and your partner can each choose your desired firmness. You are a larger side sleeper. If you are a heavier person, you might feel some firmness when you sleep on your side. Even while using a softer setting, I personally felt some pressure on my shoulders and hips. Heavier side sleepers should definitely take note. You are a hot sleeper. If you are used to sleeping on a hybrid or innerspring mattress, the Solaire might not sleep as cool. There is not as much room for airflow, so this might be an issue for hot sleepers. You are looking for an affordable mattress. While the Solaire does have a lot to offer, it might be outside of some people’s price range. Because of its adjustable air chambers and high-end design, the mattress is on the pricier side. While it is more reasonably priced than other adjustable mattresses, this is just something to note. The Solaire’s cover is 100% cotton and tufted with comfort foam. The next layer is 2” of a gel-infused memory foam. Then there is 1” of Talalay latex. This is followed by a thin moisture barrier. Next, you have the vulcanized air chambers, which are surrounded by a foam encasement. The final layer is a 1” foam, 5-zoned support layer. You can opt for a Standard or Upper-Flex model. While both allow you to adjust both sides for firmness, the Upper-Flex lets you raise and lower each side with an adjustable base. 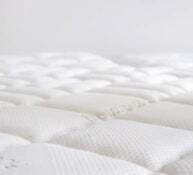 The foams used in this mattress are Certi-PUR certified, meaning they are more eco-friendly than conventional foams. No matter which size Solaire you purchase, the mattress will feature an adjustable firmness. The mattress is split so that two sleepers can adjust their side to fit their specific needs. The Solaire can be paired with the Saatva Lineal adjustable base. The King size can be placed on two Twin-XL Lineal bases so that each side can be raised and lowered separately. The air chamber is made of vulcanized rubber. This is meant to fight air leakage and ensure the air chambers last for a good amount of time. 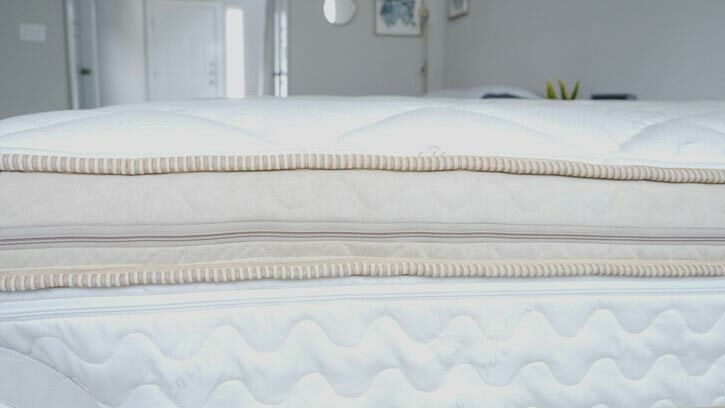 The memory foam is gel-infused, and the Talalay latex is naturally cooling. In addition, the latex is ventilated to allow for airflow. These features are meant to keep you sleeping cool. The Solaire has 50 different firmness settings. The remote control is attached to the mattress and allows you to soften or make the mattress firmer. There is a remote for each side of the mattress. The air inflator is built into the front of the mattress. This is different from some other adjustable mattresses, where the inflator is on the outside of the mattress. First off, one of the great things about the Solaire is that it comes with free White Glove Delivery. I do recommend opting for this because the mattress is somewhat cumbersome. After placing the Solaire on two Twin XL Saatva Lineal bases, I needed to inflate each side of the mattress. I pressed the Bedfill button on both sides and allowed each side to inflate. Only one side can be adjusted at a time, so it took a few minutes to inflate the entire mattress. After that, the Solaire was ready to go. Using the remote control, I could then let out air or inflate the mattress to my desired firmness. In addition, if I wanted to set it to a specific number, I could use the Memory button. Overall, using the Solaire was easy and intuitive. Given that you can adjust the firmness on the Solaire, I can’t really give one firmness assessment for the mattress. However, I can speak to the range. At its softest, the Solaire felt like a 5.5/10 to me. At its firmest, the Solaire felt like an 8/10. In the end, I saw about a 3-point range of firmness. While sleeping on my back, I took the mattress down to about 40/50. My hips sunk into the top comfort layer, but then I felt the support of the air chambers below that. Moving to my side, I adjusted the mattress to the 15/ or 20/50 range. Even at this very soft setting, I still felt some firmness on my shoulders and hips. While I think lighter people should feel nice pressure relief when side sleeping, heavier people might feel some pressure. When I slept on my stomach, I set the Solaire to its firmest setting. I didn’t feel my hips sink, and the mattress properly supported me overall. The mattress has a pillow-top feel with a bit of memory foam softness beneath that. There is also some latex in the top few layers, which adds a bit of bounce. It shouldn’t be difficult to move around on the mattress. If you sleep with a partner, you will want to know how your mattress handles motion transfer. 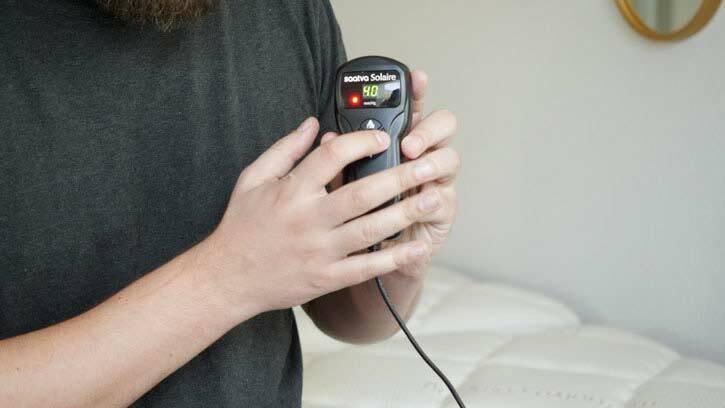 Will the Solaire isolate your partner’s movements on their side of the bed, or will you be disturbed? To test out the Solaire, I placed a glass of water on the mattress and pressed into the surrounding area. The water was only barely disturbed. The Solaire features a 2″ layer of memory foam in its comfort layer. This material is great at cutting down on motion transfer. In addition the mattress is split so that each partner has their own adjustable air chamber. This split design should further decrease the motion that transfers across the mattress. Overall, the Solaire could be a good option for couples. If you sleep with a partner, you want to know how much of the mattress you can utilize. Can you sit or sleep near the edge securely, or will you feel like you’re going to roll off? The edge support will, of course, depend on which firmness you choose. That said, there is a foam encasement that surrounds the air chambers and adds a base level of edge support. I adjusted the mattress to its firmest setting and sat near the edge. I felt very secure while sitting down and did not feel like I was going to fall forward. When I laid down near the edge, I did not feel like I was going to roll off or be ejected from the bed. In the end, the Solaire has very solid edge support. I put the mattress on the firmest level when I was on my stomach. The mattress was a good match for me in this position, as my hips didn’t sink in too far. I dialed the firmness back a bit when I was lying on my back. The mattress was a good fit for me here as well and was supportive overall. 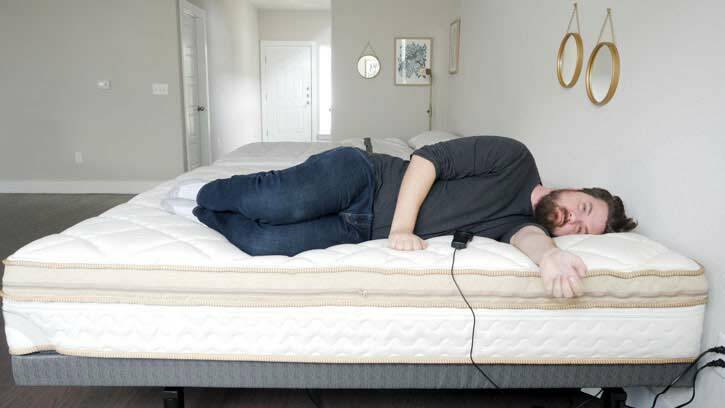 When I dialed the firmness down to the 25 to 30 range, the mattress offered nice pressure relief. I felt very nice sleeping on my side. If you are someone of my body type, you should be able to find the right firmness for you no matter which position you sleep in. Joe’s experience confirms that the Solaire should be a good match for medium- and lightweight sleepers. Provided you fall into these categories, you should be able to find the comfort or support you need in all three sleeping positions. You have multiple firmness options to choose from. With 50 different firmness settings, it should be easy to find the perfect firmness. It should be a great match for lightweight and medium-weight sleepers of any position. It works well with an adjustable base. The Solaire is split so that each side can be adjusted separately. I was very impressed by the Saatva Solaire mattress. 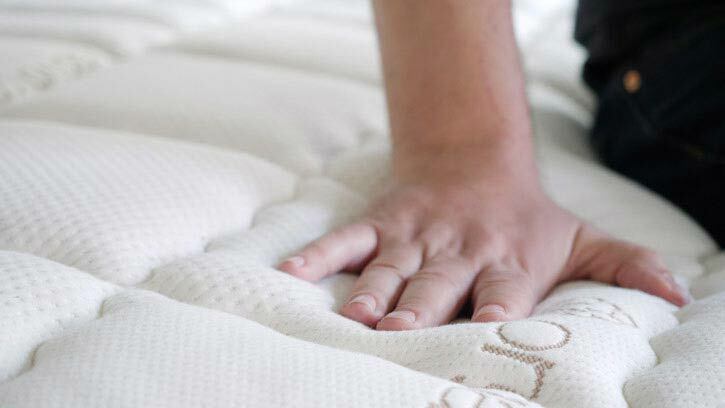 It should be a great option for those who want to vary the firmness of their mattress. Also, the mattress works well with an adjustable base like the Saatva Lineal. I will just note that the Solaire might not be a great fit for heavier side sleepers, and it could be too pricey for some. The Solaire comes with a 120-night trial period, a 25-year warranty, and free White Glove Delivery.